I love Chatbooks because they are the EASIEST ways to create quick photo albums. Seriously – they are fast, cheap, good quality, and totally child friendly. You can even have it automatically pull photos from social media or your phone’s camera roll. If you’re not familiar with Chatbooks, they are cute square photo albums that integrate with Instagram, Facebook, your phone pics, Google Photos, Dropbox, or your computer pics. Pics and captions get synced automatically, so it’s an easy and quick way to get your photos off your deices and into your hands. You’ve got options: paperback or hardcover, 6″ or 8″ size, and photo covers or stylized covers. 1. Set up an automatic book series. You can set up a book subscription to print everything you post to Instagram or mark as favorite on your phone (it’s called a series subscription on the app). My kids LOVE looking through our stack of Chatbooks and seeing our family’s memories. We use softcover for this, because it’s kid-friendly and so cheap that I don’t mind if they love it to death. But you can choose: softcover or hardcover, 6″ or 8″ square, photo covers or floral, free shipping or trackable. Want to try out a series? You can get your first book free by downloading the app through my referral link! No promo code needed, just download the app and click through to start a Series Book. 2. 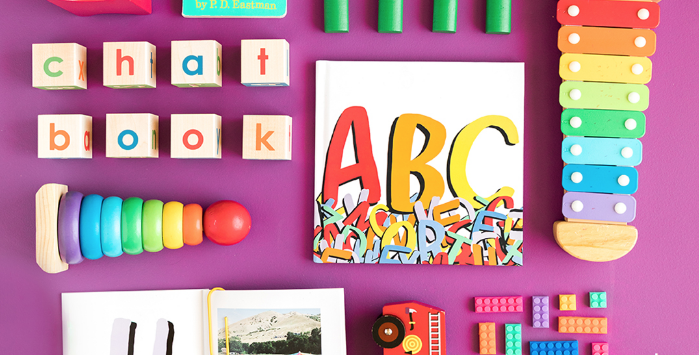 Make a custom ABC Book for a toddler in your life. Chatbooks is working with Dallas Clayton to provide cute ABC artwork you can use to make a personalized alphabet book. 3. 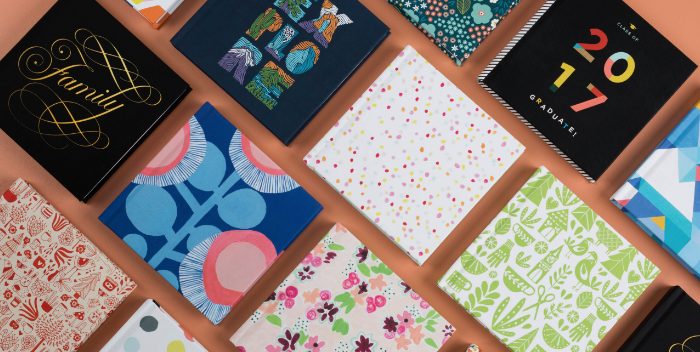 Choose the Rifle Paper Co floral covers! Chatbooks is always doing cool collaborations with talented artists, and right now you can print or reprint your series books in beautiful floral covers. (The Rifle Paper Co patterns are not available on custom books right now – but there are other covers that you can use for custom books! Look in the app for “collections” to see cover options from Stately Type, Oh Joy!, The House That Lars Built, and Lisa Congdon. All super cute, and perfect for themed books like babies, travel, etc. 4. Photograph your kid’s artwork and print them in a book! This cuts down on paper clutter and preserves the memories. It’s easy to print another copy for Grandma too! There’s a post here on how I photograph children’s artwork. 5. Make a custom book as a gift. I did one for Father’s Day recently, and we’ve done books for birthdays or the grandparents. Custom books go up to 365 pages, which gives you the ability to make longer books that the 60 page series books. I usually choose hardcover for my custom books that are gifts, which is an easy $5 upgrade. I really love the full bleed option on the 8×8″ version! If you need more reasons to convince you why we love Chatbooks, read this post. Chatbooks just started their semi-annual sale! There are only 2 major sales on Chatbooks each year – one is right now for summer and the other is just before the holiday shipping deadline. 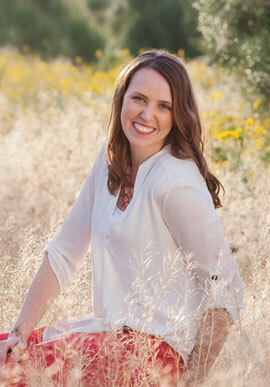 So, this is definitely the time to jump on the “easy photo book” wagon! 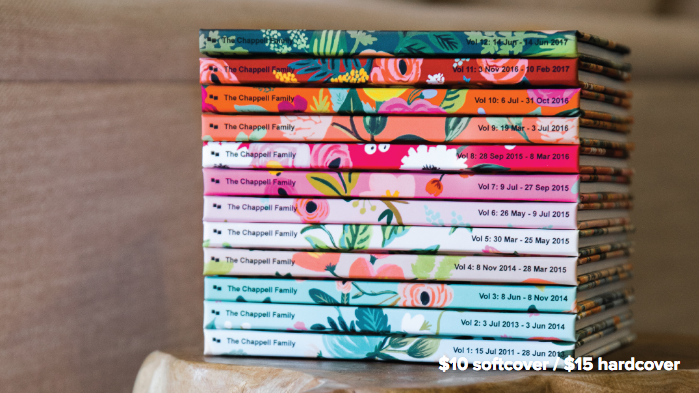 And here’s the best part – Chatbooks just started their semi-annual sale! Want me to send you a reminder email about the next promotion? Enter your email below to get my weekly newsletter and reminder emails about Chatbooks sales or new products. Or, head to the app now to take advantage of their everyday low pricing today.